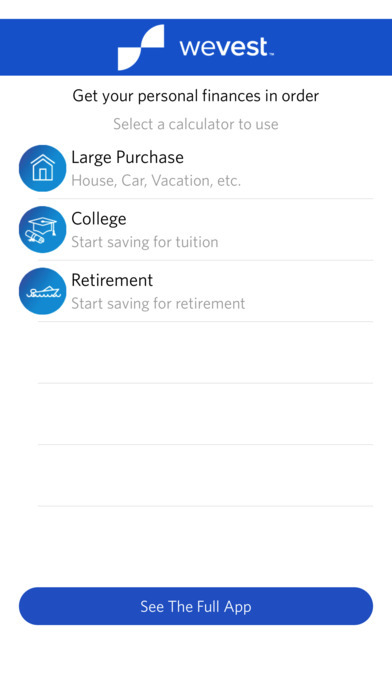 Financial planning apps are everywhere, and each has something different to offer. WeVest is a fairly new financial planning app that offers a new perspective on saving money and growing your net worth. The app promises a straightforward and inexpensive solution to you financial planning needs. But how well does it keep those promises? When you create a WeVest account, you have to answer a few questions. In order to get your full financial picture, WeVest asks you basic questions about your assets, debt, income, age, and more. These questions allow their algorithm to create separate accounts on your dashboard for each item, as well as categorize you with peer groups who use the app. Then, WeVest asks about your saving goals. Their primary options are saving for retirement, building a college fund, and paying off credit card debt. The primary goal of WeVest is “to optimize the growth of your net worth in a way that achieves your goals.” Using your answers, WeVest algorithms formulate a financial plan specific to you, using the money you are willing to invest in yourself. Your WeVest% is the percentage of your income that you want to put towards growing your net worth. Your WeVest% is divided according to your goals – savings, retirement, college debt, etc. – in the most efficient way possible. While this seems a lot like putting your money in someone else’s hands, fear not: WeVest also allows you to compare several recommended plans and pick the one you prefer. You have total control over your financial plan, supported by WeVest’s professional advice. In addition, you have constant access to that financial plan whenever you need it. Once all your information is in and you have decided which financial plan you prefer,. Your dashboard shows how much money is going to which “bucket” – savings, debt repayment, retirement, etc. – for that month. You are given a graph that will measure and predict the growth of your net worth and savings, as well as whichever other buckets you prioritize. Finally, you can also see your exact current net worth with assets and liabilities, your financial plan, and a savings comparison between you and other users in your peer group. WeVest is not a free service. Their plans consist of a $4/month plan or a $35/year plan. 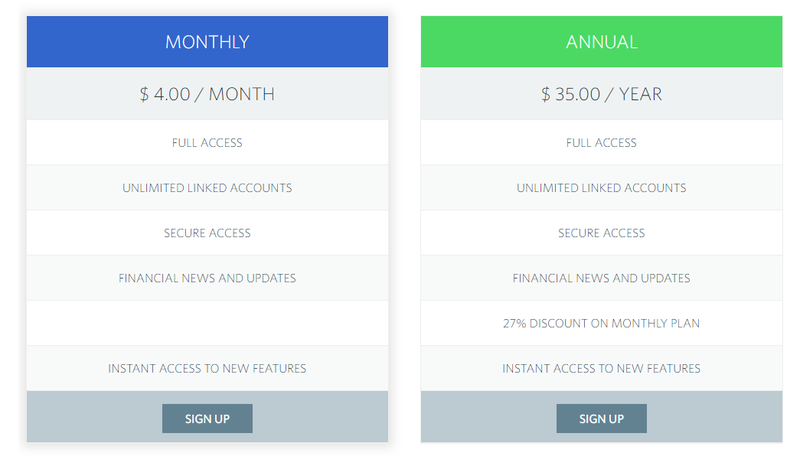 Both plans have identical benefits, with the exception of the $35/year plan offering a 27% discount from the monthly plan. When you sign up, you have to select a plan and input your card information. However, you have a 45-day free trial before WeVest takes money from your account. You may also cancel your account at any time. This way, if you think you may use the app regularly, you can still sign up for the yearly plan knowing you have time before fully committing. This app boasts the low cost of its services in comparison to face-to-face professional financial planners. WeVest offers some fantastic insights into your financial planning, but it does have its drawbacks. Its primary drawback is its accompanying app. Rather than having an app which allows you to log in and view your information on your phone, WeVest’s mobile app is a simple calculator. It is free, and allows you to calculate simple savings projections for a large purchase, your child’s college tuition, or retirement. While these are useful, they are also pointless if you have an account with WeVest. Furthermore, toggling the “See The Full App” option within the mobile app simply opens the WeVest page in your mobile browser. WeVest also caters more toward adults starting in their mid to late twenties with a stable, full-time job. College saving plans are geared towards planning and saving for your child’s future tuition rather than your own. Each financial plan prioritizes retirement funds. If you are a college student with a part-time job looking to get ahead in the financial planning game, or you are retired but still looking for a place to manage your finances, WeVest is not that place. WeVest also requires a separate account for each individual item. For example, you need a separate account for student loans, a separate account for your retirement fund, a separate account for your savings, etc. Having this many accounts seems impractical, and having to input this many different accounts gets confusing on the website. WeVest is perfect for the right people. If you are looking to keep track of your retirement fund, flesh out your savings, or invest in a home, WeVest has exactly what you need. If not, you may be better off looking elsewhere. WeVest is an incredibly thorough financial planning app that is truly a bargain for all it offers. If you want to invest in your financial future through financial planning, look no further than WeVest.